"A Unitit an Strang Africae"
a Seat o the African Union Commission. b Seat o the Pan-African Pairliament. 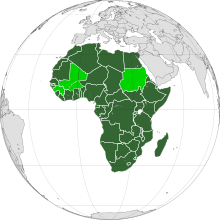 The African Union (AU) is a union consistin o aw 55 African kintras on the continent o Africae, extendin intae Asie throu the Sinai Peninsula in Egyp. It wis foondit on 26 Mey 2001 in Addis Ababa, Ethiopie, an launched on 9 Julay 2002 in Sooth Africae, wae the aim o replacin the Organisation o African Unity (OAU) foondit on 25 Mey 1963 in Addis Ababa, wae the seegnaturs o 32 governments. The maist important deceesions o the AU ur made by the Assemmly o the African Union, a meetin held ilka twa year atween the heids o state an government o'ts member states. The AU's heid boady, the African Union Commission, works frae Addis Ababa. ↑ Art.11 AU Protocol on Amendments to the Constitutive Act of the African Union. ↑ "Report for Selected Countries and Subjects". International Monetary Fund. 14 September 2006. Retrieved 26 November 2012. ↑ "Report for Selected Country Groups and Subjects". IMF. 14 September 2006. Retrieved 26 November 2012. ↑ "Report for Selected Countries and Subjects". IMF. 14 September 2006. Retrieved 26 November 2012. This page wis last eeditit on 9 Apryle 2018, at 16:08.